Parallel grids enable easy installation and alignment for bending applications. 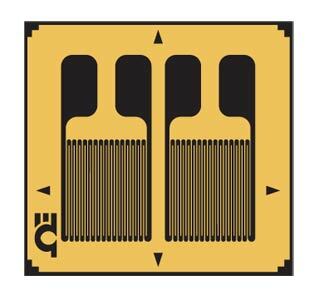 OMEGA™ strain gauges are available in a variety of models to cover most strain measurement applications. Their rugged construction and flexibility make them suitable for highly accurate static and dynamic measurement. The measuring grid is formed by etching constantan foil, which is then completely sealed in a carrier medium composed of polyimide film.